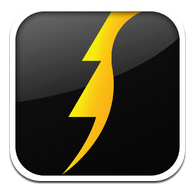 Electric Slide is an iPhone app developed by elucidate llc. While the name of this handy app might conjure up images of dated disco dances, the app itself is fully entrenched in the 21st century. 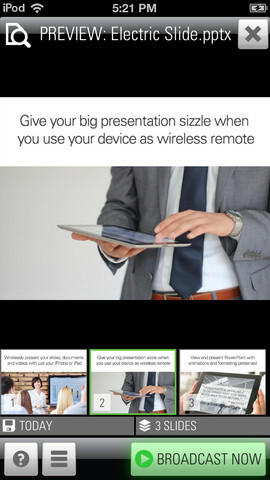 You can use Electric Slide to wirelessly present PowerPoint slides, Office documents, PDFs and videos with your iPhone or iPad. I think we’ve all had the misfortune of sitting in a meeting or a classroom lecture where the presenter was having AV issues. There’s nothing worse than sitting there, watching someone flounder as they try to set up a projector. 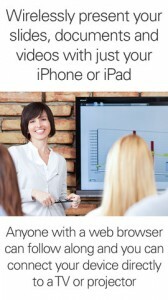 And if you’re the one giving the talk, this can be a really embarrassing situation. Electric Slide basically turns your device is a remote control: enter the URL of your creation, and dive right into your lecture. If you’d prefer, you can also connect your iPhone or other iOS device directly to a TV or projector via HDMI or VGA to present your slides. All your viewers need to follow along with your talk is a URL. Perfect for presenting your talks to small groups (or to large groups of remote viewers), Electric Slide is a lifesaver for people who are frustrated with their current presentation tools. The best part? Your content is auto-synced to your device and can be presented with no Internet connection! Actually, I lied. 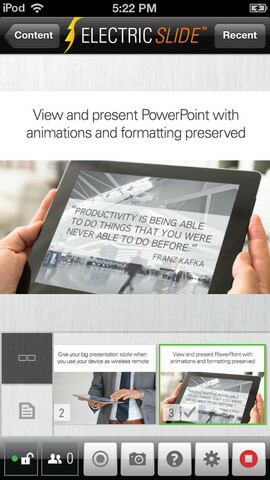 I think the REALLY great part about this app is how your audience sees one thing while you see another. In other words, you could be looking at your slide notes, thumbnails, or a list of attendees…and all the while your audience just sees your content. And as someone who never really mastered the original Electric Slide dance, let me assure you: Electric Slide the app is way more simple to use than the 70s dance of the same name. Want to see the Electric Slide app in action? The developers have put up a helpful video on YouTube. Electric Slideis compatible with iPhone 3GS, iPhone 4, iPhone 4S, iPhone 5, iPod touch (3rd generation), iPod touch (4th generation), iPod touch (5th generation) and iPad. Requires iOS 5.0.1 or later. This app is optimized for iPhone 5.